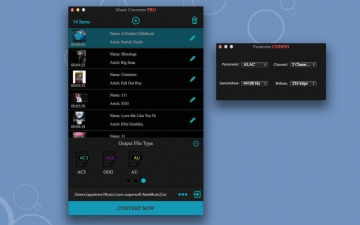 [値下げ] All Music Convert Pro | Mac App Storeのアプリ検索・ランキング BuzzMac! 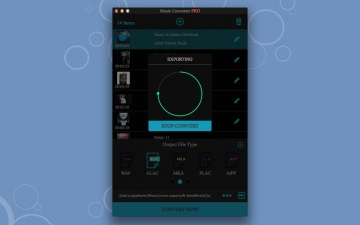 Convert from: MP3, FLAC, WAV, WMA, M4A, AIFF, FLV, OGG, MKA, AU, CAF, AIFF, AC3 and many more. 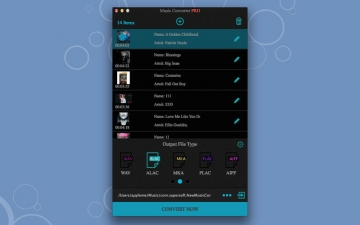 Convert to: MP3, iTunes, M4A, M4R (iPhone Ringtone), WMA, WAV, ALAC, FLAC, OGG, MKA, AU, AIFF, AC3 and more. 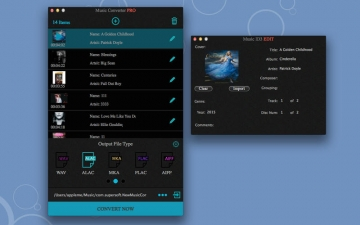 Music Converter Pro - New will also extract and convert the audio content from video formats including (MOV, M4V, MP4, DivX, WMV, ASF, MKV, AVI, MPEG-1, MPEG-2, 3GP, 3G2, WebM, DV and more). 1. support import music, video and folder . The app clearly presents your album, artist and track information for ease of converting. The app can auto save all info of your music file . Create your own custom presets by choosing advanced settings from: Format, Bit Rate, Sample Rate, Channels .